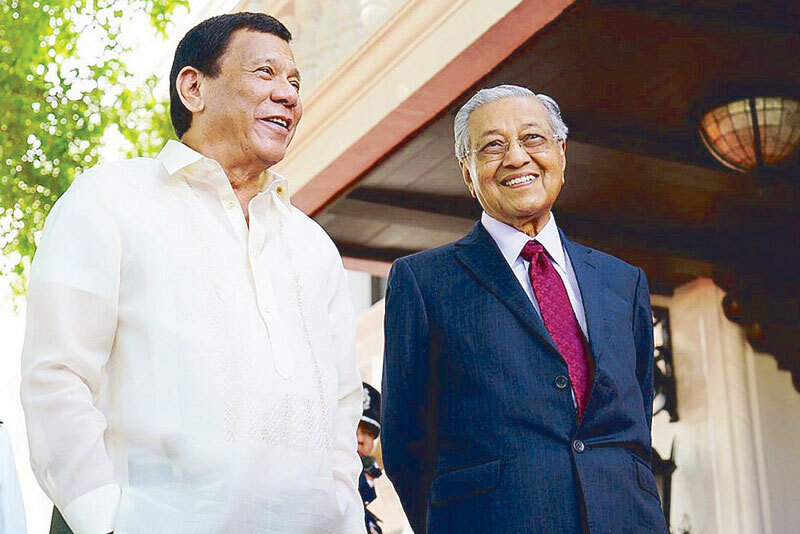 President Rodrigo Roa Duterte and Malaysian Prime Minister Mahathir bin Mohamad pose for posterity prior to the start of the expanded bilateral meeting at the Malacañang. Tun Dr. Mahathir bin Mohamad, fondly called Dr. M in his home country, is currently the oldest serving head of government at almost 94 years old. Our über-senior leaders may thus entertain ideas of hitting the campaign trail. He used to be the longest-serving Prime Minister of Malaysia in office, from 1981 up to his retirement in 2003. If one were oblivious to personal facts about world figures, one would not be faulted for concluding that PM Mahathir is nowhere close to 94 years old. His posture, his gait, the manner in which he spoke at the State Dinner in his honor, extemporaneous at that, belies his true age. When I shook his hand to greet him, his grip was firm. Much like the firm grip of former President Fidel V. Ramos, who turned 91 this month. Happy birthday, President FVR! Tun Dr. M returned as Prime Minister of Malaysia on May 10, 2018, after the victory of his Pakatan Harapan coalition in their 2018 elections. It was during his previous service from 1981 to 2003 that Malaysia experienced much growth and economic development. Just this month, Prime Minister Mahathir paid a state visit to our country. 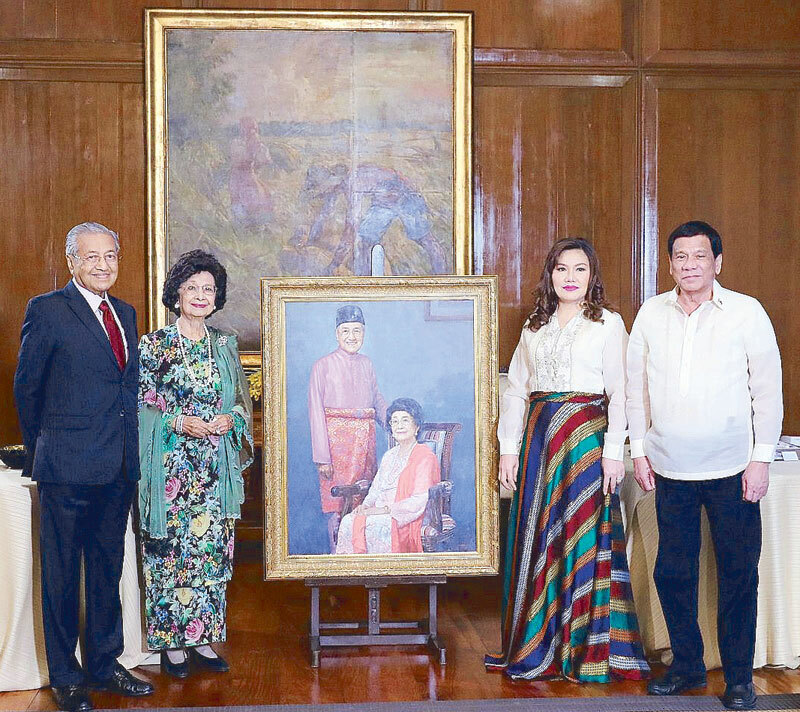 President Duterte and partner Honeylet Avanceña with Malaysian Prime Minister Mahathir and wife Dr. Siti Hasmah Binti Haji Mohamad Ali following their exchange of gifts at Malacañang. The last time a Malaysian head of government visited the Philippines was in November 2017, by then Prime Minister Najib Razak. The last time that Tun Dr. M himself was in this country officially was in 1996 when he attended the APEC Economic Leaders’ Meeting in Manila and at the Subic Bay Freeport. Malaysia is one of our closest neighbors, perhaps the closest geographically. Our cultures and traditions are so intertwined in that we also share the same racial origins, so much so that the use of the term “Malaysian cousins” has factual basis beyond merely just being polite. 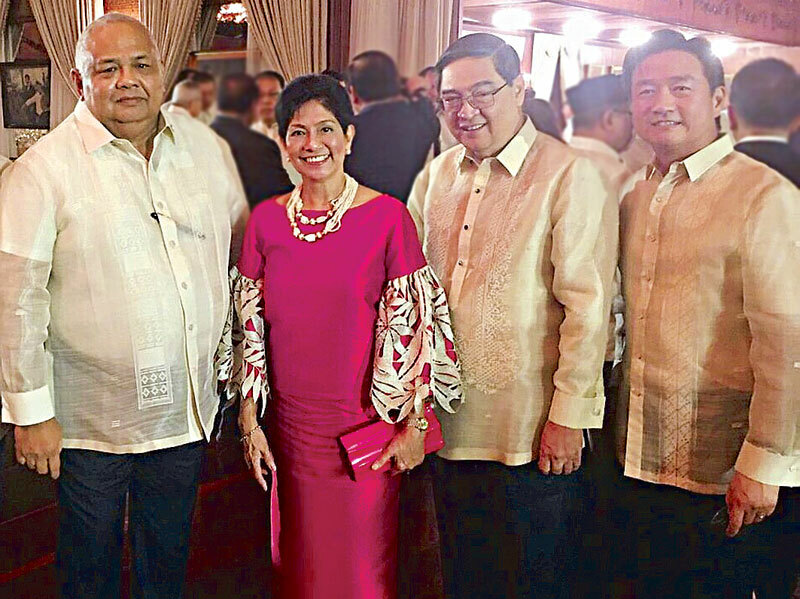 Bangsamoro interim chief Al Haj Murad Ebrahim and wife Hadja Lupia with Donato Almeda. In his short but sweet visit to the Philippines, Tun Dr. M made several affirmations of commitments with our country. The first is that both the Philippines and Malaysia pledged to work to maintain peace and security in the region, as both re-affirmed the importance of a peaceful and amicable settlement of disputes with China without resorting to threat, violence or the use of force. (From left) Executive Secretary Salvador Medialdea and wife Betty with Paul Dominguez and Alfred Ty. On the Philippine claim to Sabah, however, the Duterte administration has assured the Filipino people that government has not abandoned its claim. This issue was not discussed by both leaders, but the President had long said that the claim to Sabah shall be pursued only through peaceful means. The Philippines can also expect better and stronger partnerships and trade opportunities with Malaysia. 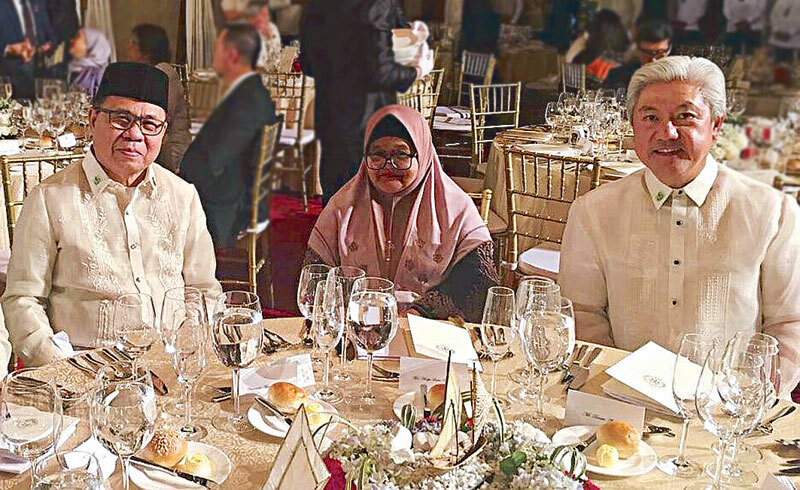 Trade Secretary Ramon Lopez, during the business forum with the Malaysian Prime Minister, also mentioned that private companies and enterprises can develop greater exposure to each other’s home countries. He encouraged Philippine companies to increase their investments in Malaysia, noting that there was heightened interest in Malaysian companies to set-up business here. 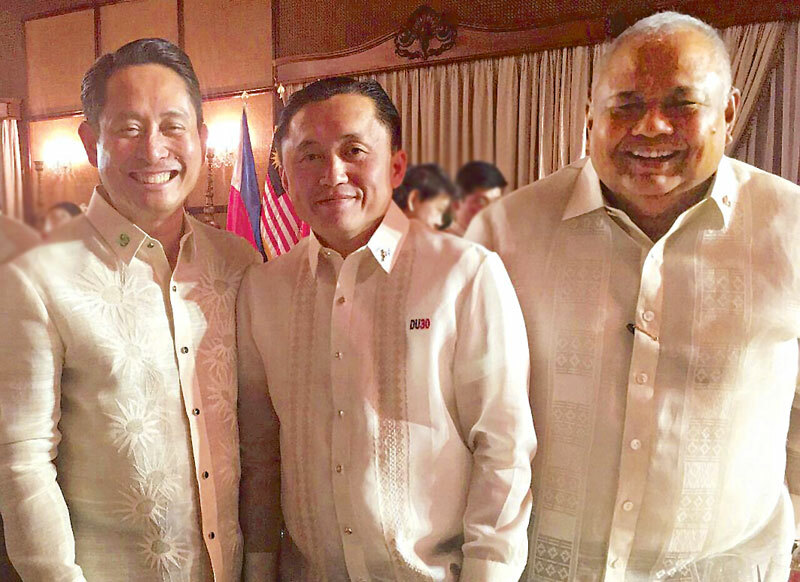 With former Special Assistant to the President Bong Go and Secretary Salvador Medialdea. Malaysia is currently the Philippines’ fifth largest source of approved foreign investments as of 2018, totalling P15 billion and representing 8.2 percent of total approved investments last year. Malaysia is the Philippines’ 10th largest trading partner with total bilateral trade of $6 billion. It is also the country’s 11th export market and ninth import supplier. On his part, Prime Minister Mahathir said that Southeast Asian countries must focus on the development of certain industries to improve intra-region trade. He said that the ASEAN should now craft a policy framework that should specify what industries each member-country should focus on. With this, he said that Asian economies will be able to trade products and services that complement each other, instead of compete with each other. 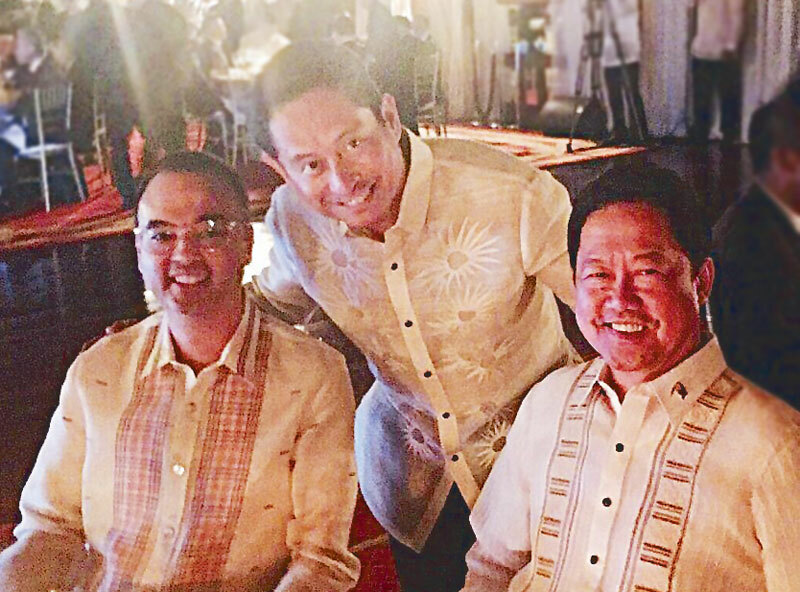 Former Foreign Affairs secretary Alan Peter Cayetano and Justice Secretary Menardo Guevarra. 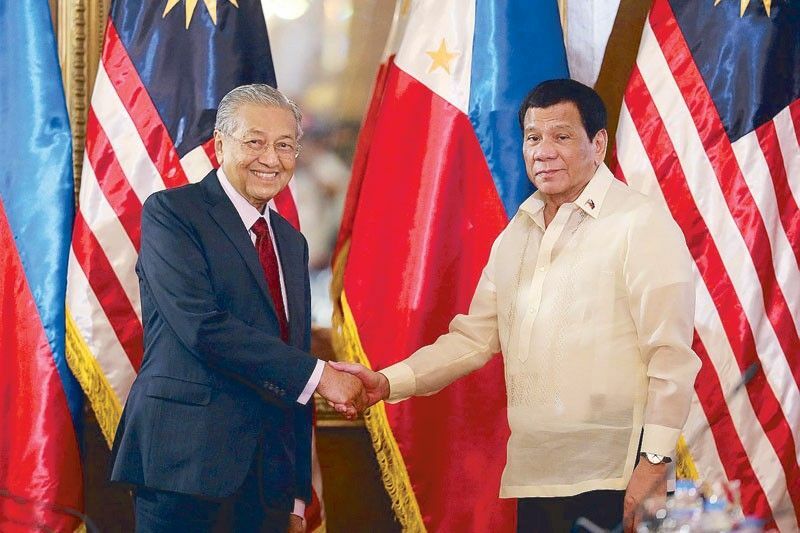 Tun Dr. M also vowed that the Malaysian government will help in the development of Mindanao and noted the economic potential following the establishment of the Bangsamoro Autonomous Region of Muslim Mindanao or BARMM. Indeed, a good neighbor and cousin we have and have always had in Malaysia, and this could not be emphasized more than by the strong resolve of the determined leadership of both countries.